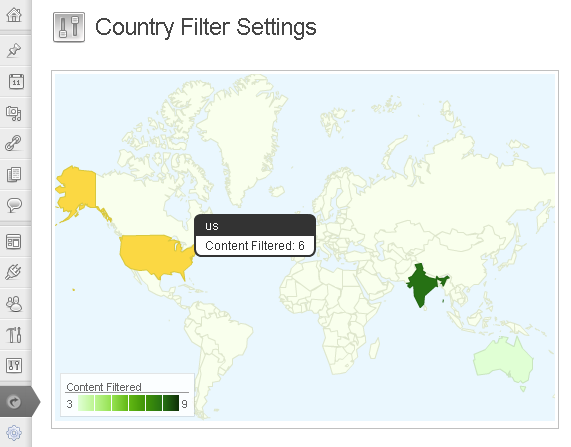 Country Filter plugins allows you to control the visibility of WordPress elements depending on the users country of origin. You can hide or show certain elements of a page or some sections of a post from users browsing from a particular country. For example you could have a ‘donate’ button that displays only if the user is browsing from France, or display one ‘Buy Now’ button for a particular country and another for other countries. Maybe you want to display a video only for users in the US or Australia. Developers and designers could use the plugin to load different stylesheets based on the users country. Services like hulu.com uses techniques such as this to constrain viewership to a particular country. Installation instructions are provided in the download. Country Filter plugin works mainly in two ways – via a short code, and by directly adding some PHP code. The easiest method is to use the short-codes. This will allow you to show/hide content in posts by using the ‘country-filter‘ shortcode. For example if you want to show a certain part of your posts/page only to users who are browsing from ‘United States’ or from ‘India’ than you can use the following code. The code used are the ISO 3166-1 alpha-2 2 digit codes. Setting the above shortcode in a post/page will display the string ‘Hello World!’ only for the users in US and India. People in other countries will not be able to see the string. On the other hand, setting the display attribute to ‘0’ will hide the content for users in US and India but will display the string to people from other countries as given in the following code. Note that the content between shortcodes can be anything you like. Suppose you want to display a ‘Buy Now’ button in a post, maybe you are selling a product and want to add different prices – one for the users in the US and another for all other countries. You can then use the short codes as below. So now, if a user is browsing from the US the first shortcode rule applies and the text ‘Buy Now for only $45’ is displayed, on the other hand, for users from other countries the second rule applies and the text ‘Buy Now for only $32’ is displayed. As said earlier the second shortcode hides the text for the users form the US but displays for all others. The short code takes two attributes, both of which are mandatory. code : A comma separated list of 2 digit ISO 3166-1 alpha-2 country codes. display : Set to ‘1’ if you want to display or ‘0’ if you want to hide the content. If set to ‘0’ the content will be hidden for the given countries but displayed for others. You can nest your other plugin short codes in between the ‘country-filter’ short code to control the visibility of the other plugin data. For example, the following code nests the WordPress ‘gallery’ shortcode, which will now only be displayed if the user is browsing from the US or India. Maybe you have a form plugin which provides a ‘[form]’ shortcode and you want to display the form only for users NOT from the US. The following gives an example for that particular scenario. You can also filter content other than posts with the isCountryInFilter function. Note that for this you will need to make changes to sections of the theme files. For example if you would like to display some content – like a button, a widget or some section of a web page, that should only be visible for people browsing from US, UK or Australia than you can do it as follows. // browsing from US, UK or Australia. You can also add a else section. // given here but not the above. This is a powerful way to control content on your WordPress site. You can control almost any type of content with this method. You can hide/display entire sections of WordPress depending on the users country. Note that the isCountryInFilter function takes an array of country codes and returns true if the country code of the user browsing the site is in the array. Note that this function is especially useful for developers, as they can include custom code and other files depending on the users country. Another function added in version 1.5 is showCountryContentInPage. This function is just like the short code version above, but can be used to manipulate content other than posts. This takes an extra ‘display’ parameter after the countries array. If set to ‘1’ than the content will be only displayed for the given countries. If set to ‘0’ than the content will be hidden for the given countries but displayed for others. Take another example – we want to display different banners depending on if the user is from the US, the Netherlands and a third banner for all other users. // The banner here is displayed only for users browsing from US. // The banner here is displayed only for users browsing from Netherlands. // given here but not the US, or Netherlands (nl). Another example – you want to display a certain banner in the sidebar (or anywhere else) which will be visible to all the users from all countries except the ‘US’; in short, we want to hide the banner for users from the ‘US’ only. The plugin dashboard also displays the total number of times any content has been filtered by geographic areas. Note that data logging is disabled by default so you will need to enable it from the plugins admin section to be able to see the data on the map. You can also export the generated data as a CSV file, which you can further analyze in a spreadsheet. If the plugin fails to activate and displays and error, check the table names in the database, they are case sensitive. They should be ‘ip2nation’ and ‘ip2nationCountries’ if you are using the ip2nation Version of the plugin. This will work on Windows but will fail on Linux systems as the files there are case sensitive. This can happen if your PC is behind a firewall, proxy or a VPN. This programs tend to hide your original IP address, which can result in incorrect results. This is something the plugin, or for that matter any other plugin, cannot do anything about. 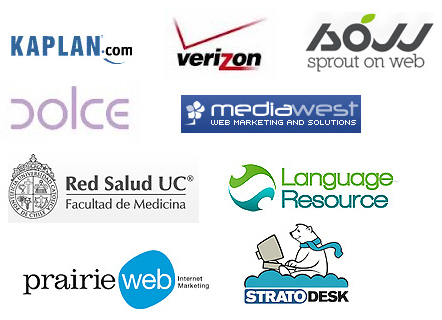 You can read more about VPNs and the list of a few providers here. Will the plugin work with mobile devices and sites. As long as your mobile device provides a correct ip address the plugin will work without any problem. Go to a site such as http://www.whatismyip.org/ or http://www.whatismyip.com/ to check the ip address of your mobile. * ADDED: New function and changed some logic. Thanks to Matt of NuFlux Media Inc for providing excellent feedback. * ADDED: Users visualization by country. Hi, is there a option for a City Filtrer? I only work in spain, and I nedd show diferents image depending of the diferent city. Now I have seen post N 145 of RAJESH. But Do you are working in that? When users can have this option? Not within 1 month for sure, but will be available in the next 6 months. Actually the problem lies with the db size for cities,which is kind of huge compared to the countries database. I’m not informatic but I understand what you mean. 1. The City option must include a radius where administror can introduce radius value (ex 50 km.). So, picture will showed also at the users next to the “CITY”. 2. The administrator interested in “CITY OPION” in the 90% of case only works in a specific state. For ex. I am working in spain, and I need “CITY OPION” only for spain. Maybe also for argentina. But I don’t need “CITY OPION” everywhere. Do you understand what I sayd? I hope your news about that. I wanted to know if I can differentiate between mexico, peru, argentina, spain and global? VPN will give inconsistent results. Use some other computer to check. Also you can use http://www.whatismyip.com/ to test if the country is showing correctly in the browser. Disable any WP caching plugins. You could use the ‘isCountryInFilter‘ PHP function in the plugin to do that (look at the example above). However, I’m at present not free to support any coding. Hi i want to buy plugin. But ı use quick adsense for banner ads and ı want to target ads by countries. But i want to know that it is compatible or not with quick adsense widget ? Note that you will need to manually add this in the post or pages where you want to control the ad display. Automatic insertion of ads by Quick Adsense will not use country filter. But the statistics I see that there are visitors from other countries of the world … How is this possible? Is the plugin works well? The plugin adds hits from all countries and not only those configured. Can you please help? thanks. Disable debugging in WordPress if it is enabled, in ‘wp-config.php’. Thanks Sameer for getting back to me. I changed the line you suggested and the error went away so Im hoping I am good to go. However, I am still working on my local install (in use) and was wondering if I can test it from here or if I need to test it on a live site? Nevermind, I just installed on live site and it seems to be working! Cool! I didn’t seem to need to alter the code as I did on my local install either. Thanks Sameer, very excited to start using this! Thank you and sorry I didn’t read previous comments, best. Any ideas would be much appreciated. Thanks. Here is the General code but you can check my website to see what I mean. Please follow the installation instructions provided in the PDF. Could you help please with this error? Looks like you have error display turned on in WordPress. Disable error reporting in WordPress, or add the following line in the Country filter plugin file ‘country-filter.php’ at the start. Hi Sameer. 9 months ago (february 5, 2015) I asked you if the COUNTRY FILTER PLUGUIN can show a banner only at users connected from a litle zone, like a City. You told me that this feature will be available approximately in the next 6 months. Now I contact you in order to understand if “CITY OPTION” is at this time available, or if I need wait 1, 2 or 3 months more. So, I need know if I will have diferent shortcodes for each banner that I will create. Let me know. Thanks for your support. I’ve experimented with the City option, but with the current (free) database available it is somewhat inaccurate. We do get a accurate database but the cost of the plugin will increase substantially, which I do not want to do. So at present the city plugin option is not available. I’ll surely let you know when one becomes available. Hi sameer, thanks for your answer. I do one question and one suggestion. QUESTION: Is Maxmind a free plugin (in order to have geolocation data base)? SUGGESTION: When users ask you for CITY OPTION, in the 99% of de case there is no very very important absolutelly precision… Following I explain you why. So, I think you can use a free plugin because precision there is not important, it is more important the aproximation. For example you can say that the option is not CITY OPTION, but is CITY RADIUS OPTION or PROVINCE OPTION. For example I live in GIRONA CITY. If I use MAXIMIND it say that I am connected from “TOSSA DE MAR, GIRONA, SPAIN”. TOSSA DE MAR is an other city at 50 km of distance. But MAXIMIND also indicate the PROVINCE (GIRONA) and this province is correct. So I think is very interesting considerate PROVINCE OPTION in your COUNTRY FILTER PLUGIN. Do you think PROVINCE OPTION is a good option? Do you think PROVINCE OPTION is a solution tecnicaly possible using a free plugin? I hope your answer. Thanks very much. Maxmind does not offer any freeplugins, their database is however free. The city lite database is around 30MB. I’ll play around the database and let you know. Nice plugin, but it has a massive issue for anybody using it in China. In the backend it seems it’s using jsapi which is being pulled from google.com. jsapi is an online only resource so can’t be downloaded. Normally no problems… but in China, Google is blocked. This means with the plugin turned on every dashboard action takes 60 seconds while it tries to connect to Google, fails… then the page loads. Otherwise this plugin simply can’t be used by anyone in China without a VPN. 1) I have a site featuring media content that needs to be access-restricted from certain countries. 2) For each content (photo gallery and video gallery) I should be able to set a blocked country/countries. 4) Blocking should be seamless and discrete for the blocked visitor. When directly trying to access a blocked content the visitor should be redirected to the portfolio page or presented a 404 (not found) message, NOT a 403 page (forbidden). Can I achieve this with your plug-in? I’m trying to buy your plugin but the purchase link says it’s expired, and when I use the download link provided, it doesn’t seem to be working and I can’t find an installation .pdf in the folder. Just wondering if this plug-in still worked and If i could get it! The plugin is currently free to download. The download link on this page is working, although I no longer support the development of the plugin at present. Please read the documentation provided before installing. The home button on websites is dying, but should it?